The Silurian coastal Maine magmatic province is characterized by commingled gabbroic and granitic magmas that have resulted in magmatic structures such as pillows and pipes that can be used to determine the kinematics of the magma chamber. On the Eastern Head of Isle Au Haut, students map and collect structural data on the contacts between commingled gabbroic and granitic/dioritic sheets and the pipes and pillows that form along the base of these. 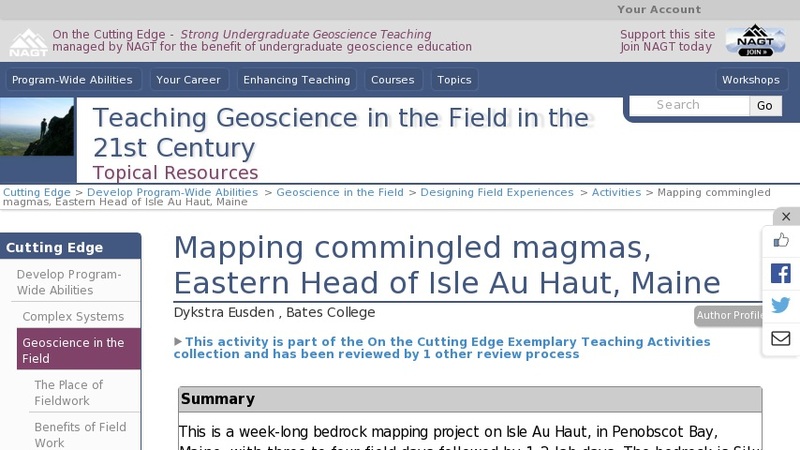 A bedrock geologic map and cross section are then made in ArcGIS showing the geometry of the magmatic sheets. We kayak out to the island to map it, but there is also a ferry there. Eastern Head is situated within Acadia National Park and, as a result, no hammers can be used.